I love trying new things when I travel and that applies to drinks as much as to food. 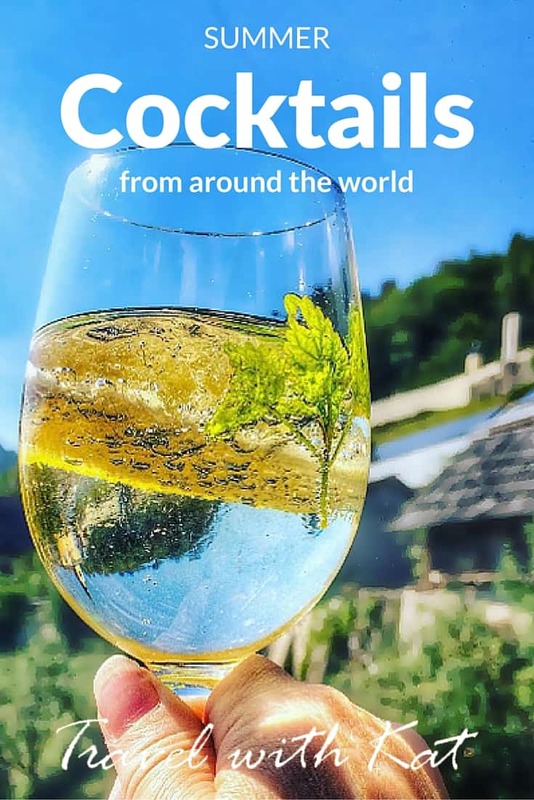 I’ve been discovering new cocktails around the world for many years. To help get us all into the spirit of summer (even if the weather here in England isn’t always obliging) here are my favourites from the ever so British Pimms, which you will find at any refined summer garden party or fete to a spicy Caribbean rum punch to be enjoyed while the sunsets across the sea to the sound of a reggae rhythm. Enjoy! A must for a sunny, summer’s day in England, I first came across Pimms at a Summer Ball while I was at university in Bristol. And I’ve loved it ever since. Refreshing and fruity and very quaffable. Fill a highball (tall) glass with ice cubes. Pour 50ml Pimm’s No.1 and 150ml lemonade into the glass. Garnish with the lemon, cucumber, a couple of strawberries and a small spring of fresh mint. Hugo is an even more light and refreshing drink. I first discovered in a picturesque little village in Slovenia. It’s popular in a number of countries including Germany and Austria but it originated in South Tyrol region of northern Italy I’m told. 1. Place a few chunks of ice into a red wine goblet. 2. Pour in the syrup, Prosecco and sparkling water and stir. 3. Garnish with a slice of lime and a small sprig of fresh mint. Tip: rub the mint leaves together to release the aromas before adding. Aperol has been made to a secret recipe, since 1919, including bitter and sweet oranges and many herbs, roots and even rhubarb, in perfect proportions. And the Aperol Spritz was a favourite with all my fellow bloggers when I visited Bologna a few years ago. It is without doubt Italy‘s favourite aperitif. Pour the Prosecco and Aperol into a large red wine glass over ice. Add a squirt of soda. One warm spring evening on a roof-top terrace in Athens, I sipped a pale pink cocktail, as the sun went down. My drink, a Cosmopolis, was made from Skinos, a delicious Mastiha liqueur which has a subtle but distinctive, slightly aniseed flavour and can be served chilled as an apéritif or digestif. It is made from mastic, a resin collected from an evergreen bush found only on the Greek Island of Chios. Shake all the ingredients with ice and strain into a chilled Martini glass. Garnish with a slice of lime and it is ready to serve. Sangria originates from southern Spain. This particular recipe is made with Blossom Hill sun-Kissed Red, a fruity wine that is served chilled. 125ml Blossom Hill Sun-Kissed Red or a fruity Spanish red of your choice. Fill a large red wine glass with ice. Add the wine, smooth orange juice and lemonade. Garnish with mint and a slice of orange. My most recent discovery from my trip to Menorca and an absolute revelation. I thought I hated gin but I simply love this Menorcan gin based drink. You can buy Pomada ready mixed or make it yourself as follows, ideally with gin from Menorca which is quite unique. Add the gin, lemonade, soda water and sugar syrup. When I arrived in the Caribbean for the first time on the island of St Kitts earlier this year, I was greeted with a Rum Punch, a delicious spicy sweet and sour cocktail, perfect any time of year. It has a lot more ingredients than any of the other cocktails here but it is well worth the effort. Slice the fruit into wedges. *You can use any combination of orange, lemon, lime and pineapple and place in the punch bowl with the cinnamon stick. Pour in the remaining ingredients into a tumbler glass and stir. Adjust citrus and liqueurs so that the sweet–sour balance is to your liking. Laddle the drink with some fruit pieces into highball glasses, over ice. Grate a little ginger over individual drinks to garnish. Another drink I discovered during my visit to St Kitts was Ting with a Sting; the Ting being a Caribbean grapefruit juice fizzy drink that is both tart and sweet and the Sting being white rum. What could be simpler, yet it is one of my favourite refreshing summer coolers. Pour the Ting and rum into a highball glass over ice. Add a twist of lime. Most of these recipes I brought back from my travels while a few are from thebar.com. You’ll find plenty more ideas, including some great variations on some old favourites, on their site. What I love most about the site though is how you can compare prices for the ingredients from leading supermarkets. When I looked at the price of Pimms No.1, it cost anything between £10 and £18 pounds for a litre bottle depending where you bought it from. A huge difference, so it’s well worth your while checking it out. Do you have a favourite summer cocktail? Brought to you in association with thebar.com. How about the Hungarian fröccs? It’s just wine and carbonated water, the proportions you can decide yourself. It sounds lame on paper but it’s actually quite good in Budapest summer heat. And it’s low on alcohol and calories, so not unhealthy either. I recommend! Sounds excellent, not lame at all and as you say, perfect for a hot day. Oh yum! I don’t know which one I like better. But I love a good Cosmo. Did you try all of them in the Caribbean? Now i have a list haha. Only the last two in the Caribbean. They are ALL my favourite – not sure I’d want to drink them all on the same day though.